Very informative video about the origins of Old Norse Viking names. The names were predominantly constructed by combining two words. Suffixes were specifically male or female. The same prefixes could be used with either. Examples like: Harald Bluetooth, Sweyn Forkbeard. Superb 50 minute lecture-style presentation of Norse religion in the Viking Age by the guys from Hurstwic. Including stories about Odin, Thor and events around Ragnarok. The text description on YouTube promises this will be the first in a series… we’ll await in anticipation for the next! BBC’s “Last Kingdom” TV-series is based on Bernard Cornwell’s fantastic historic fiction novels about Uhtred of Bebbanburg. Season One is showing on the Discovery Channel in Europe. A season two has been confirmed. In many ways History Channel’s “Vikings” about Ragnar and Rollo may have gotten a head start, but for entertaiment “Last Kingdom” is catching up and fast! And as credible historical fiction, “Last Kingdom” is clearly ahead! The ITV series “Beowulf: Return to the Shieldlands” was recently canceled due to low ratings after only one season with 11 episodes (ITV originally announced plans for at least 5 seasons). It thus became the latest in a line of failures in bringing the dramatic and epic poem to life. Why is there this seeming difficulty or “curse”? Remember the 2007 animated version of Beowulf (the one where Angelina Jolie was used as basis for the mother of Grendel)? It stands as a quirky experiment, but not exactly a satisfying re-telling of the epic. Or the 2005 movie “Beowulf & Grendel” starring Gerard Butler and Stellan Skarsgård? Again a faltering attempt at bringing the epic myth to life. Neither the TV series nor the movies have been able to capture the true drama, conflict or epic feel of hero versus monster. 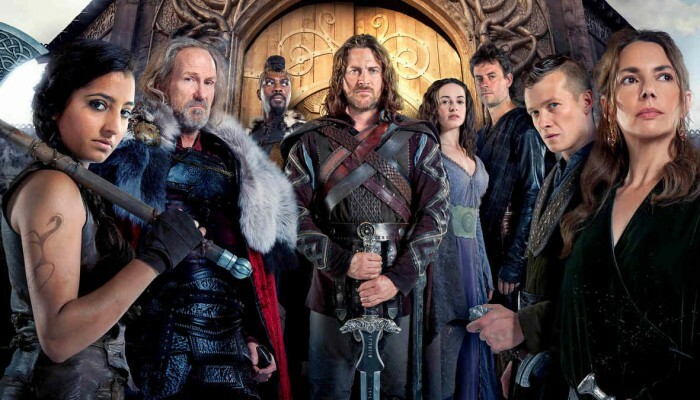 But, perhaps Beowulf is subject to the same curse that has plagued many of the classical myths and legends in making it successfully to the movies or TV. Need we mention: “Troy”, “Clash of the Titans” (or the sequel “Wrath of the Titans”), “Immortals” or “First Knight” and “Excalibur”. And, it is telling that the camp-y TV series “Hercules: The Legendary Journeys” and “Xena: Warrior Princess” could be mentioned as partially successful! It just seems odd that the same industry can bring us top-notch, modern age, man versus monster myths like “Lord of the Rings” and “Game of Thrones”! Bernard Cornwell sets the standard for historical fiction, and in doing so with The Saxon Stories book series (and The Last Kingdom TV series based on the books)… has brought focus to an exciting period of UK history! There is a tendency still today of a perception that in historic times people were not mobile, because of no cars, trains, powered ships or aircraft voyages. However, there was substantial mobility during the Roman Empire era. Also, the whole Migration Period saw entire peoples moving right across Europe. Therefore when the Viking Age came around it was not a new phenomenon. Yet, the Norse/Vikings took exploration and voyages to a level – which would not be rivaled for another 500 years with the advent of the Age of Discovery. Below is a smart interactive map showing some of the many exploration achievements of the Vikings. Not unexpected given the viewer success, then History Channel has renewed “Vikings” for 5th season. This then also gives Michael Hirst and the rest of the production team a chance to redeem themselves after the historical mess they’ve blundering ever deeper into! “Vikings” remains entertaining, but as quality historical fiction which was the premise it was launched on, it’s an increasing disappointment. A bit surprising really that no one higher up in the History Channel organisation takes a stand and demands more actual historical accuracy! It seems like Trivago completely overlooked Baltics, Eastern Europe and Russia, and adding a couple should have made this a Top-10 list. It could also be argued that The Danevirke Wall and Hedeby/Haitheby in present day northern Germany is missing. Whay do you think? Locations that should have been on or left off the list? With the longer “Vikings” season 4 well under way, here is newly released mid-season trailer. Swedish historians discover Viking Age parchment having been used as binder cover for a later book. The newly discover Latin texts are believed to date from the period 1070 to 1090. Very few pages from the Viking Age survive within Scandinivia – as writing only spread with Christianity. Once the parchment has been freed, it will be photographed. Historians in the UK and US will also study the Latin texts. The video in link below is in Swedish, however the footage of dis-assembling the book cover speaks for itself! ?